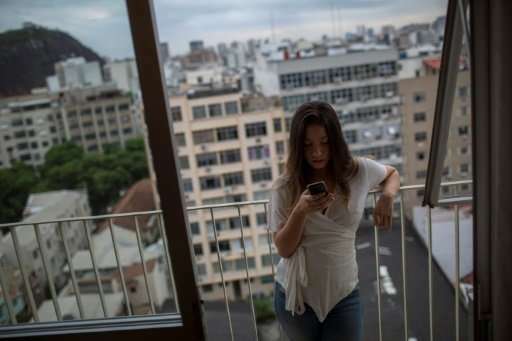 Brazilian high school student Mariana Alves is a former patient of digital addiction therapy group "Delete"
Like many young people, 29-year-old student L.L. loves his cell phone. So much so, in fact, that his studies, his work and even his personal relationships have suffered, and his phone eventually became a way to avoid people in the real world. That was when he realized he needed help. L.L., who like other patients interviewed by AFP asked that their full names not be used, suffers from a form of digital dependency known as "nomophobia," a neologism derived from the term "no-mobile-phone phobia." It is a condition with real psychological, social and physical consequences and is on the rise in Brazil, home to the fourth largest number of internet users in the world. In September, the student started on a course of treatment in the Delete Institute, the first in Brazil to offer free digital detox to online addicts. Set up in the psychology department of Rio de Janeiro's Federal University in 2013 by psychologist Anna Lucia King, the Delete center has already treated 800 people suffering various types of dependency on digital technology. The profiles vary, from adolescents who spend hours playing video games on their computers, to adults who have lost a spouse over their addiction, or who were fired from jobs for spending too much time on Facebook or WhatsApp. Newly enrolled patients undergo an evaluation by a multi-disciplinary team and answer questions to establish the source of their dependency. Afterwards, a psychologist evaluates whether there is any sort of clinical disorder present, such as anxiety, panic attacks, social phobias or obsessive compulsion disorder. Afterwards, they are classified into one of three possible categories: conscientious user, abusive user or dependent, and offered treatment sessions tailored to individual needs and the gravity of the case. The aim of the treatment is not to demonize technology but to allow addicts to use it in a healthier manner. In weekly group sessions they discuss their experiences. They also are given exercises—like trying to read a book or watch a movie without looking at a cellphone—and taught good practices—known as digital etiquette. The goal is to help a person go from an abusive user to a conscientious one. Some disorders may need to be treated medication. As well as causing emotional problems, nomophobia can inflict physical suffering on an addict. The center's physiotherapist, Mariana King Padua, explained that prolonged use of cellphones, and the angle of the users head when staring at a handheld screen, can put so much pressure on the neck that it causes injuries. "The neck muscles are not adapted to this kind of workload," she said. Heavy usage of technology does not necessarily make a person an addict: that only happens when their use becomes exaggerated. "Abusive behavior occurs when the virtual world starts to impinge on the real one, that's when people lose control. It's a fine line," said Eduardo Guedes, Delete's specialized digital media researcher. The ubiquity of online technology and the penetration of the internet into everyday modern life can often blind people to their own addiction. Many times, it is the people around an addict who seek help for them. That was the case for H.B., 24, whose mother brought her to the Delete Institute last August to treat her dependency on computer games. "I didn't even notice that I had a problem," she said. "You get used to it, it's difficult to stop." Moderation is hard to come by these days in the largest economy in South America. 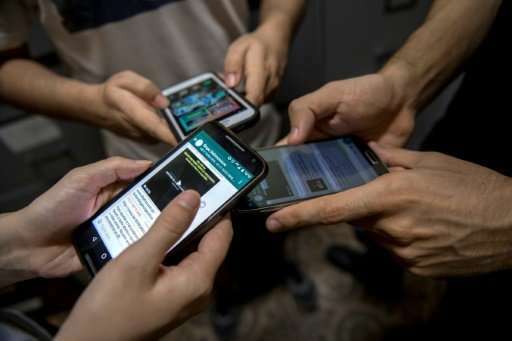 In 2015, 50 percent of Brazilians, or 120 million people, were connected to the internet, trailing only behind China with 705 million, India with 333 million and the United States with 242 million, according to a UN report on the information economy that was published in October. Around 85 percent of online Brazilians use digital media to communicate with each other, while 77 percent use Facebook and other social media platforms like Instagram or Snapchat, according to Brazil's Internet Managing Committee, which oversees internet usage in the country. While nomophobia is still a relatively new concept in Brazil, it is widely acknowledged as a public health problem in countries like South Korea, Japan and China and is treated in rehab centers. Both patients and therapists at the Delete Institute believe they can learn to live in harmony with the new technologies. "I am getting better with the exercises," said L.L. "The problem with intensive Internet usage is that you end up neglecting other aspects of your life." King explained that the end of a course of treatment does not mean that the patients will no longer need support. "If they feel the need, they can come back," she said.